The celebrated German opera director and impresario August Everding died in 1991, but his respected productions linger on. Mozart’s “The Magic Flute” was a favorite project, and throughout the decades Everding created sibling versions, using different designers in different cities, yet achieving unmistakable consistency in their storybook settings and traditional charm. At least four of his “Flutes” are revived this season alone — in Finland (designed by Toni Businger), Berlin (Fred Berndt), Munich (Jürgen Rose) and Chicago’s Lyric Opera (Jörg Zimmermann). The Lyric’s “Flute” as conceived by Everding was first performed in September 1986, which makes it 25 years old. As opera productions go, that’s a dangerous age. Too young to be a precious antique. But old enough to be taken for granted. Will this “Flute” get a white-glove restoration? Or will it be replaced? One does not know. But if you want to catch a glimpse of the classic Everding style, now would be the time to do it. Jörg Zimmermann’s set design is pristinely simple and has some cool, time-tested touches, such as the air-ship the Three Boys tool around in. The restaging by director Matthew Lata, in the spirit of Everding, takes a light touch regarding the romance of the Prince and Princess and their tests of character. Masonic symbolism is at a minimum. Papageno takes his comical lack of bravery directly into the delighted audience. And the presence of many children onstage is a sure sign the show is pitched to a broad age group, with a serene avoidance of both high seriousness and low comedy. However, the production itself is sadly dilapidated. A few of the costumes for the animals tamed by the prince’s flute can be described as endearing only in the way that a child’s favorite sock puppet, faded by the wash and mauled by the family dog, is still clutched to the heart. Those pop-up flowers that are harbingers of a happy ending — you couldn’t get a cup of coffee for the lot. The Queen of the Night could use an elevated throne, the better to orate from, and her three Bag Ladies are in desperate need of new makeup, hair, threads … the works. The production was least flattering to the Queen (coloratura soprano Audrey Luna) and her trio of attendants (soprano Elisabeth Meister and mezzo-sopranos Cecelia Hall and Katherine Lerner). Perhaps they attempted to compensate by over-acting in the first scene, where the royal party must convince Prince Tamino to rescue the Queen’s daughter on their behalf. In any case, the musical rewards of the evening began with Tamino’s lovestruck portrait aria, “Dies Bildnis ist bezaubernd schön,” sung with lovely tenderness and intensity by New York tenor Charles Castronovo in his Lyric debut. 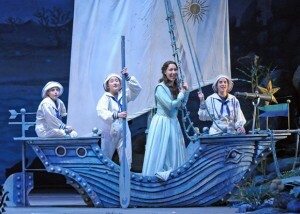 Soprano Nicole Cabell, another cast standout, takes the ideally suited role of the abducted princess, Pamina. The Lyric Opera regular is a graceful delight on the stage, generously reacting to the magical goings on about her. Pamina’s famous aria of heartbreak, “Ach, ich fühl’s,” in the mistaken belief that all is lost, was meltingly beautiful on opening night. And she brightened the happier scenes with charismatic smiles. 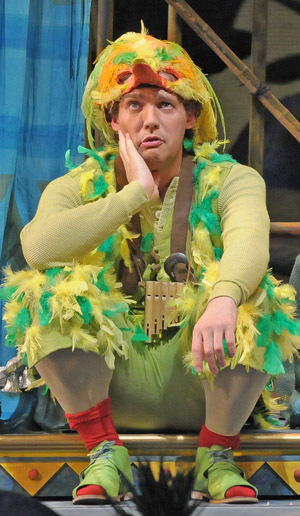 “Flute’s” most endearing character is Papageno, the colorful bird-catcher and humble stand-in for all of us ordinary folks in our weaker moments — when we have a tough time wrapping ourselves around the idea that bravery is really all that necessary, especially if it’s going to hurt. 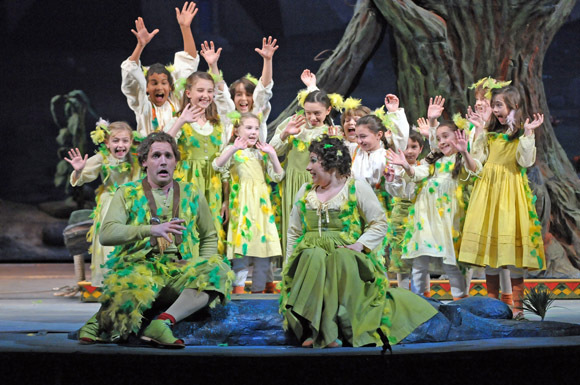 Lyric’s Papageno is a treat of international stature, the French baritone Stéphane Degout in a polished performance. The comedy is rich indeed as Degout’s birdcatcher fibs, fudges and flubs his way through his reluctant adventure as Prince Tamino’s sidekick. The sweetest scene of the night comes midway through the first act, when Papageno sits down with the Princess and confesses his desire for a wife to call his own. Degout and Cabell’s subsequent reverie on married love, “Bei Männern, welche Liebe fühlen,” was a show-stopper. Günther Groissböck, as the wise Sarastro, was a comforting figure with a medium-color bass of good range and sufficient lyric poise to float the long, long lines of “In diesen heil’gen Hallen.” And tenor Rodell Rosel revealed enough spry craftiness in Monostatos’ lawless ways to make you want to root for him, just a little. Lyric’s artistic director and conductor Sir Andrew Davis took a graceful, unrushed approach to the score, and flutist Jean Berkenstock brought Prince Tamino’s flute charmingly to life. As for how the story of “The Magic Flute” turns out, I’m not saying anything, but you can probably tell by the pictures at the bottom of this review. 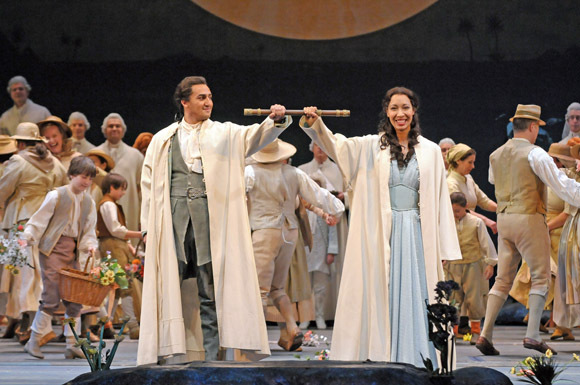 What the Lyric Opera will decide about this “Flute’s” future is the open question. As any operagoer knows, each new commission brings its own risks and potential rewards. Will Chicago get something more or less the same spirit of Everding’s traditional approach, such as the Canadian Opera Company’s new production by Myung Hee Cho in Toronto? Or will the company go for a setting more updated, such as the Katharina Thoma production that has just opened in Kassel, Germany? 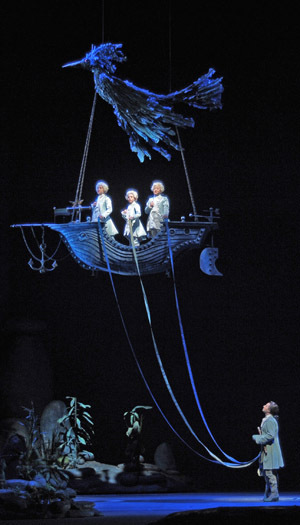 Or perhaps something quite avant-garde, and less child-focused, like the Viesturs Kairišs 2001 production with designer Ilmārs Blumbergs for the Latvian National Opera? Will it have puppets? A digital dragon? Whatever the choice, the Lyric will indeed be fortunate if it is able to enjoy a production as long-lived as Everding’s. Everding died in January, 1999: Read the obituary and appreciation in the Independent. Story summary and commentary: Click on AUDIO to listen to William Mason’s scene-by-scene breakdown at the Lyric Opera site.